As every month, here is our cultural minute where we will make you discover and enjoy the lives of the Miao Dong and Yao minorities. This month, we are honouring the embroideries they make. Embroidery is certainly one of the essential elements of the culture of minorities in southern China. Indeed, it is thanks to the ornaments of the fabrics that these communities differ from each other, but also from each other. Textile ornaments are also an asset for seduction among the various minorities, a sign of elegance and pride. Each minority has developed its own method of ornament independently of each other. Discover the embroideries and techniques used by the Dong, Miao and Yao as well as the technical changes that are taking place with technological progress. Among the Dong, the method of embroidery on simple fabric uses a needle and wool or cotton thread (a little like the Western canvas, but without a previously drawn pattern). 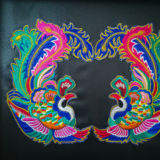 This fabric is used to decorate the bags traditionally worn by Dong women and to decorate the collar of jackets and sleeves. The patterns are always geometric but sometimes represent animals or rice fields. The tradition persists but the meanings are lost in time and it is very difficult to know their origins. There is also the weaving (without loom) of very thin strips used as straps for the traditional shoulder bag. The patterns are always geometric. 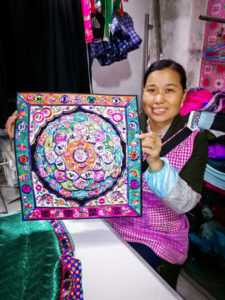 Nowadays, among the Miao, embroidery differs completely from the one found among the Dong both in its patterns and its methods. It seems that the patterns have changed somewhat recently because there are many abandoned looms in the houses, looms with which geometric patterns worn on old clothes or by people of a certain age were woven and which were similar to those worn by the Dong. Today, the fabrics are much more colourful, flowery and better suited to a young population, but with the desire to preserve the tradition and to develop it. We can find references to consumer society such as “iPhone” embroidered on a sleeve. 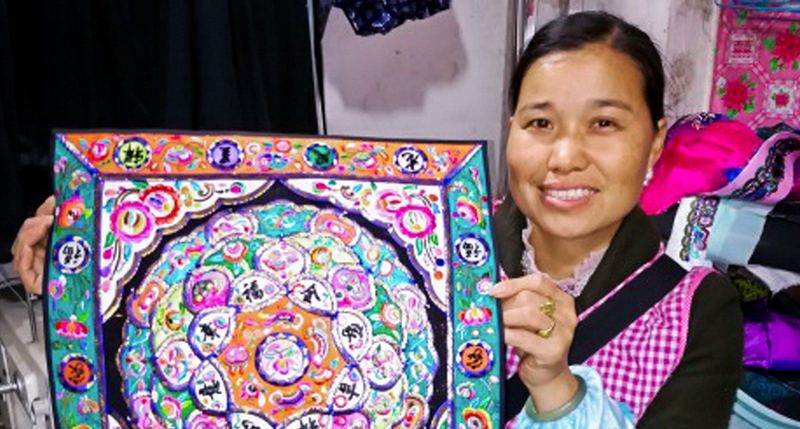 The traditional method of embroidering Miao motifs is that of cut paper. The paper used was originally made by the Yao minorities, who use bark and rice straw to form a sticky molasses that they spread on a fine hopper before letting it dry in the sun. This paper was also used to make umbrellas. Nowadays, cardboard paper (cardboard paper from cigarette cartridges such as “bristol”) on which is drawn the desired pattern (animal, flower, geometric shape, sinogram…) is recovered, the pattern is then cut finely and stuck on a piece of coloured fabric. A few rare cutters do this meticulous work and often do not embroider themselves, they cut designs at the request of the embroiderers and create new designs that they sell in their shops. They also photograph the glued patterns, the pictures are sold as “patterns” to be cut out, which is much cheaper than the glued patterns. This cutting work is, according to embroiderers, the most complex part of embroidery work, which is also why “patterns” are expensive. The scraps of industrial fabrics are recovered and sold in small pieces in order to be frayed and thus obtain very fine threads that will be used for the embroidery itself. In the city, you can meet ladies, a piece of fabric in hand, who come to look for scrap of the same shade in order to extract the threads. The paper stuck on the fabric will be trapped by the coloured yarn, creating a certain relief and also giving rigidity to the pattern. Some embroidered pieces may take up to a year to make, they are large and complex pieces, made of several layers of cut paper with overlapping patterns (baby carriers). Embroidery competitions are organized (especially in Guizhou) in which Danian embroiderers also participate. As the Yao minority is not very well represented in the vicinity of Danian, it is more difficult to observe the embroideries characteristic of this minority. However, you can still see an old loom operated by a 97-year-old woman in the Yao village of Qiuka!!!! Traditional embroidery tends to be replaced by semi-industrial embroidery, producing patterns on strips, which seamstresses buy in batches. They cut out these strips before sewing them on to the clothes. The machines, controlled by computer, require the arrival of a programming expert in order to reproduce in digital language the designs created by embroiderers or seamstresses. This is the most complex and expensive part of the process, which is why once the programming is done, it is necessary to produce many identical patterns to cushion this step. 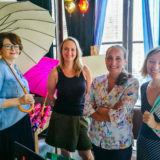 These local workshops remain family and craft businesses. In the region, embroidery, which, when walking through the streets and villages, seems to have disappeared, is a craft cultivated in the shadows. It is occasionally practiced in the home or at the back of the store for personal production or as a hobby. The garment is no longer entirely decorated with hand-embroidered strips: embroiderers often only make the tank top’s breastplate or only a few strips, the rest of the embroideries being bought in the shop and from digital workshops.